Taking my Dad to see the surgeon today. Isabel Marant blazer, shirt and pants. Nine West boots. I love this! That color combination is great! Good luck to your Dad with the doc!! Great blazer! I love all the details and it looks so good with the red jeans. Love this hip, fun, and coordinated look, Anna. Good luck with the doctor's appointment! What a great mix of beautiful pieces. The blazer is stunning! I really like the pairing of the boots with this too. You look gorgeous!. Good luck at the doctor with your Dad. 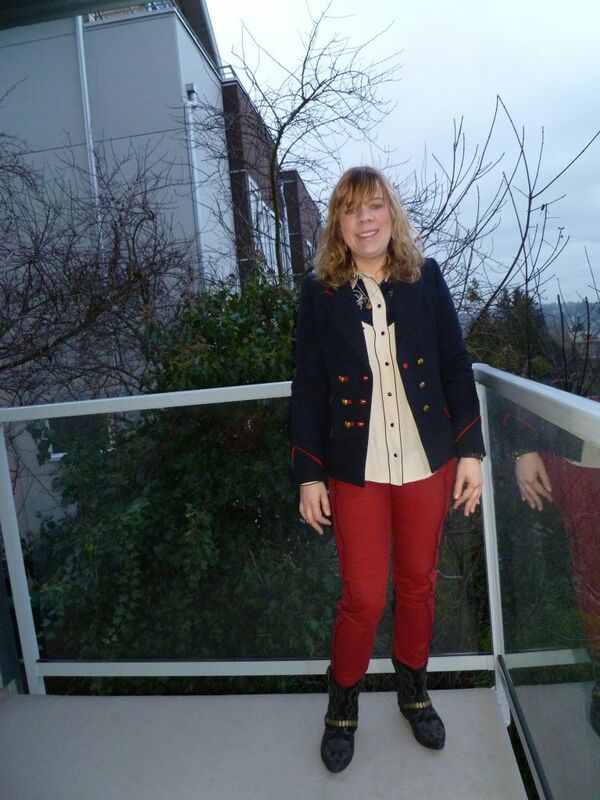 That blazer is stunning on you Anna and goes soooooo well with the red pants. Fabulous outfit! Good luck with your Dad's appointment. You are one excellent daughter and you look fantastic! Good luck to your dad. That jacket is so killer. I love how you have the embellished top underneath... I probably would have always defaulted to a plain top. That is such a gorgeous blazer. You look great! Gorgeous color, great details! Hope the visit goes well and you have some time to yourself today. You certainly look ready for great things! I love that jacket looks good with the red pants. Anna you look great in this. That blzer is wonderful! Great outfit! I love you in that blazer. Good luck to your dad! Love you in that blazer, especially with those pants. I hope everything goes well with your dad today. Thanks everyone. I almost was going to take a break from posting, but Mo convinced me. My dad said I looked nice today, though he didn't understand the boots. He liked his surgeon. My I love that jacket on you. Good luck with your dad. LOVE the embellished top with this, I'm with Rae and Mo in that I'd pick something plain but the embellishment really is such a step up! Must keep that in mind. Glad to hear the appt went well, hope things get back to normal soon for you. Um, lucky surgeon. You looked great. I am glad your dad felt okay about things.